Being short-listed for a World Spa Awards™ nomination provides you, the Nominee, with the ideal opportunity to promote your potentially award winning products and services ahead of your competitors. to use the Nominee Shield© or Vote For Us buttons. a dedicated Vote For Us page to use in the marketing of your nomination. The following items are included in the Nominee Package. All items are digital products which will be delivered via email. This is your World Spa Awards™ mark of excellence to use across all marketing materials. The World Spa Awards™ Nominee Shield© Agreement grants you permission to use the Nominee Shield©. 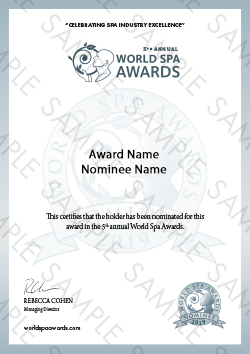 A digital copy of your World Spa Awards™ Nominee Certificate. Use this to print your certificate locally, to post online or use in other marketing materials. Incorporate the Vote For Us button into all your Vote For Us marketing and hyperlink to your Vote For Us page. The button is supplied in various sizes for web use and in PDF for print. The Vote For Us web page is central to your nominee marketing and provides you with a dedicated url (e.g. worldspaawards.com/vote/your-nomination-name-2018) and web page around which you can build your Vote For Us campaign. You may provide the following optional items to provide voters with more information about your product or service.